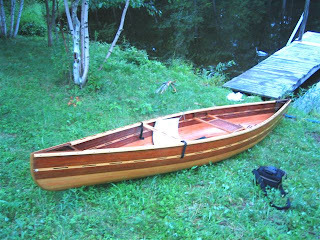 I've been selling plans for home canoe building for a few years. The most popular plans are for the Elan and the Red Fox. Recently, I sold a set of Elan plans to a fellow in Brazil. It seems that he is working very hard to establish North American open canoeing in his home country, and is developing a special interest in Freestyle paddling. 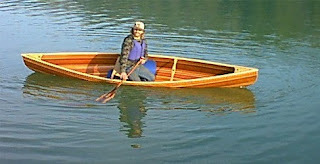 Mark Molina went over to deliver a Freestyle course, and recommended the Elan as a suitable canoe for building. Thanks,Mark! Both canoes are 14' length with 30" beam. 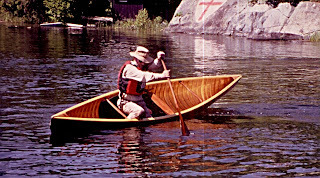 The Red Fox is a copy of an old Chestnut Fox, and is a great all-round solo canoe. 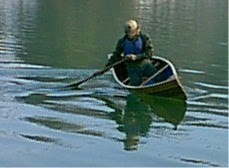 The Elan is my own design, is a good general purpose canoe for a skilled paddler, and a great Freestyle canoe. This is Mark paddling an Elan of my construction. I wish that I could paddle as well as he can, he's one of the best! 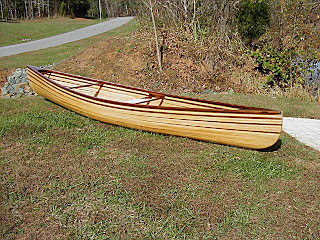 Below are photos of canoes built to the Elan plans. Nice job, all.